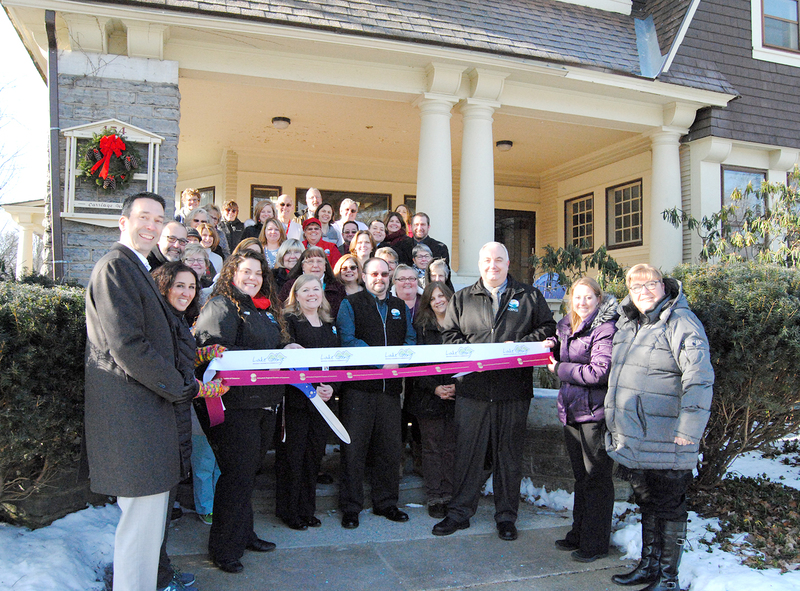 Officials attended a recent ribbon cutting to mark the move of High Peaks Hospice, which relocated to 454 Glen St. in Glens Falls after outgrowing their space at 79 Glenwood Ave.
High Peaks Hospice has relocated to 454 Glen St. in Glens Falls after outgrowing their office at 79 Glenwood Ave. The new location, once a private residence, has plenty of room for expansion, she said. In addition to the main building, there is a 900-square-foot carriage house on the property. Several offices, including Multari’s, are located in the carriage house. High Peaks does not offer inpatient hospice care The location on Glen Street houses office and support personnel only. The organization provides hospice care to patients in their own homes. Although some hospice programs offer inpatient care, the majority of hospice care in the United States takes place in the patient’s home. Multari sad it is a common misconception that hospice refers to an actual place. “It can be, and we are in the middle of a feasibility statement with House of Grace to see if that’s something that is needed and is feasible in this area,” she said. House of Grace is located at 33 Henry St. in Glens Falls. They provide terminally ill patients with a “place to live and accept life’s end in peace and comfort.” They are not a hospice facility, but all of their residents receive hospice services through High Peaks. According to Multari, another common misconception is that hospice care is only for patients who are on the verge of death. Multari said some patients have died within days of being admitted to hospice. In order to begin the High Peaks admission process, all it takes is a phone call from the patient or a member of the patient’s family or medical care team. After that, a hospice nurse is sent to the patient’s home to provide information on the program. Patients have access to nurses, social workers, chaplains, and volunteers. They are all members of what High Peaks refers to as the patient’s “circle of care” team. Volunteers are integral members of the team. They visit patients in their homes and read to them, talk to them, or sit with them while their caregiver runs errands. High Peaks is always looking for new volunteers. “We have a very extensive volunteer program that they have to go through,” said Multari. In 2018, High Peaks Hospice served an average of 58 patients a day. They cover a 5,400 square mile area and have 42 employees working in three offices. In addition to their office in Glens Falls, they have offices in Saranac Lake and Mineville. High Peaks Hospice offers other services including bereavement groups. These groups are open to anyone in the community and meet regularly at the three hospice offices. Another program, Rainbows for all Children, is designed for children and teenagers who are experiencing loss due to death, divorce, deployment of loved one, or any other circumstances involving loss. High Peaks is also developing a new program that is focused on encouraging people to live their best lives. They will be partnering with life coaches and hope to offer informational classes by the end of the year. It will be open to all members of the community. For more information, visit www.highpeakshospice.org or call 518-743-1672.